Lauren Spiro’s magical book conjures creativity from tragedy, visions from madness, and leadership from despair. I was especially inspired by her courage to challenge racism in the context of a terrible crime. This heartfelt account of Lauren’s life will inspire everyone to reach higher. In this moving, beautifully written memoir, Lauren Spiro tells of unfathomable loss, the madness of a psychiatric system that would diagnose her with “chronic schizophrenia” at age 16, and her ultimate recovery from both of those childhood traumas. In her poetry and prose, we see too that words—the language that can bring us understanding and compassion—can have a healing power of their own. Powerfully written, this personal journey from loss and sadness to reclamation and healing is soul-redemptive and emotionally stirring. Thank you Lauren for being real, vulnerable, and sharing your story which will ultimately empower others to share theirs. 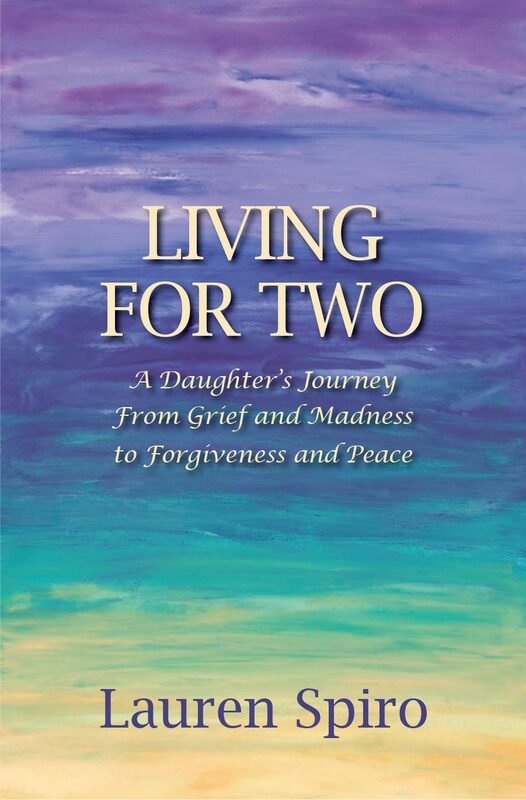 A beautiful story of liberation and growth, Living for Two eloquently expresses the path to forgiveness and offers the reader tools and inspiration to get there. Interspersed with dream-like color paintings and poetry, Lauren’s story blends her personal life history with accounts of the larger movement for mental health liberation. A revealing story that will help other survivors of loss and trauma find hope and possibilities. Lauren’s story embodies the strength and resiliency of persons who have experienced trauma. With refreshing insight she graciously shares her journey and the tools and resources that have been the wind beneath her wings. Lauren takes us on a journey where culture and cosmology enter different doors of the same house. Living for Two is a love story that celebrates the fragility of humankind and the resiliency of one very brave and wise little girl. Lauren Spiro’s Living for Two provides a compelling account of the struggle to map the unfathomable territories that lie at extremes of human experience. Her recovery and transformation after senseless violence, profound loss, spiritual emergency and extreme mental states exemplify hope, resilience and post-traumatic growth. People in recovery, psychology and social work students, helping professionals, children of violence, and others will find this small volume worthwhile. Lauren invites the reader to accompany her through experiences of devastating personal loss and abuse, and being further harmed by the mental health system. Lauren’s creativity, reflected in her prose, poetry, and painting, evoke insight and empathy in the reader. Living for Two takes its place in the literature of personal challenge and recovery, and the ensuing social activism they engender. A powerful story of a young woman’s experiences with trauma and her courage to reclaim a path of recovery and healing. This memoir should be read by all who work in the mental health field. Lauren’s story is as courageous as it is tender in her exploration of how our deepest losses shape the soul, how fear and misunderstanding can too easily silence it, and how love can give our souls voice again, no matter how long they have been silent. Lauren’s memoir invites us to consider whether there is any wound love cannot heal. A question we must answer with our own lives and hearts.